- Foster's Beer does the James Bond Goldfinger thing with Holly Valance. last year, Sky+HD did the same thing with Kelly Osbourne. - The Monkeys are no longer Drunk. They're just regular Monkeys now. Australian Agency Three Drunk Monkeys will be now known simply as The Monkeys. - Ten memorable ads that defined a generation. - Facebook never liked breast feeding. Now they don't even like the word "breast." - This is what Calvin Klein thinks is customers do all day long. - American Express has launched Friends of Japan, a program that is "designed to reignite attention and support for earthquake relief efforts." This is, by far, the strangest spirits ad we have ever seen. EVAR. It comes to us from none other than Bundaberg rum, the company that "blew up" an alligator and then apologized for not actually blowing up an alligator. 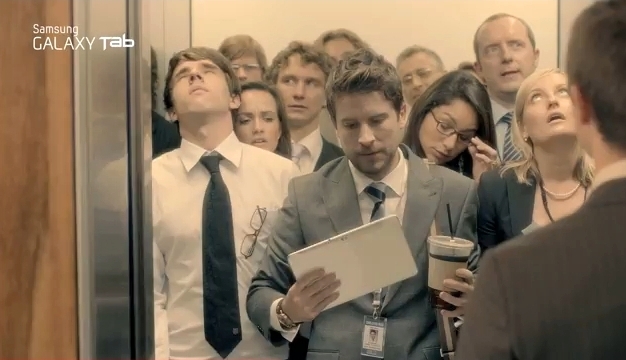 Created by Leo Burnett Sydney and directed by Tom Kuntz, the commercial mirrors (mocks?) an 80's music video. In the spot, we see a dweebish twenty something walk into a bar looking for a drink. As he approaches the bar, a bartender in a white tux opens up a door between his crotch and offers up a tour of the Bundaberg world. Over the top is an understatement. The fantastically goofy song was written by Leo Burnett creatives..
American Eagle Outfitters is the place you shop for baggy cargo shorts, rugby/polo-style short sleeved shirts or a nice sundress. A nice combination of preppy meets ripped, baggy jeans for the younger set. In 2006, though, someone at AE noticed many young girls didn't want to look so young (or preppy) any more and aerie was born. If you're unfamiliar, aerie is the place 15 year old girls go to buy lingerie so they can seduce 25 year old guys into taking them out on dates. 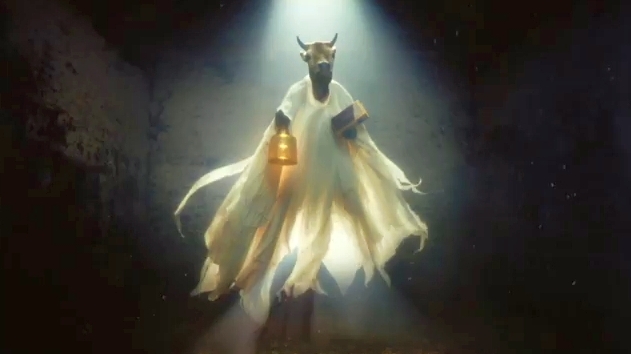 A new epic/mystical commercial from Wieden + Kennedy London asks the question, "Wonder who first thought to milk a cow? What exactly happened?" That question is played out across the 60 seconds of the commercial which examines thousands of years of human history until an "unhinged genius" experiences the vision of...a cow angle floating in the air uttering, "Milk Me!" Absolutely hilarious! Widen + Kennedy London has delivered...ahem...unhinged genius...in the form of a 60 second commercial for Cravendale milk. 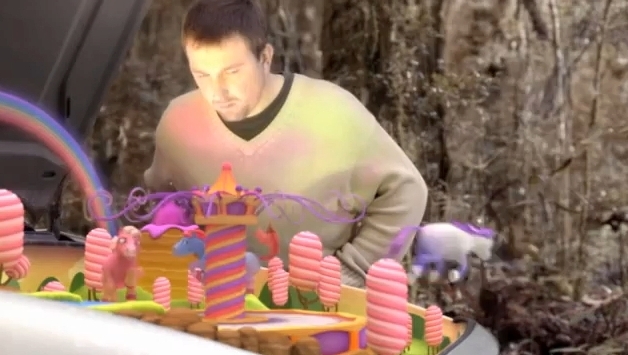 All we get from these three commercials for the Samsung Galaxy Tab are questions. First, what idiot would give up their tab instead of their coffee if given the choice? Why can't parents teach their children to behave in public? And why do parents feel trickery is needed to conceal the fact they are using something THEY bought? Today's as good a day as any to, once again, feature the latest Who is That Hot Ad Girl hotties. If you aren't already familiar with Who is That Hot Ad Girl?, it's a site that answers the burning question, "Who is that hot ad girl?" Currently featured on the site are Rachel Specter who has appeared in commercials for McDonald's, RGX Body Spray, Miller Lite and the Adam Sandler movie, Just Go With It; Angelina Vitale who has appeared in Keystone Light and Chevrolet commercials; Jaime Ray Newman who has appeared in PETA ads; Ashley Michaelsen who has appeared in Certain Dri commercials and Bre Joyner who has appeared in York Peppermint Patty commercials. The site adds a couple of hotties each day so there's always a fresh selection of advertising deliciousness to appreciate. Chrysalis Lingerie is out with a video that features Maya, a woman who used to be a man and has discovered a new-found purpose in life after becoming a woman. Maya talks about her discomfort with her body prior to having plastic surgery and how she has now found comfort with herself and her body.